The cheerful exterior of Stones Throw. Photo courtesy of Stones Throw. Rendering of the bar at The Vault. 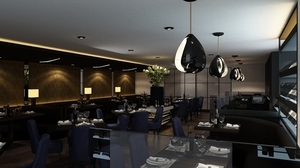 Rendering of the dining room at The Vault. 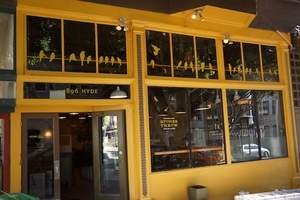 Over on Russian Hill, the Hi Neighbor Hospitality Group will be closing ~STONES THROW~ on January 1st, 2019, after five years in the location. They decided to close after the City mandated a seismic retrofit, which would force the restaurant to be inoperable for months. You can swing by for a four-course, prix-fixe menu of signature dishes (of course, the squid ink conchiglie are on there) for $40 from now until they close. Sunday brunch is also happening. And, obviously, their New Year’s Eve dinner will be a blowout ($130). 1896 Hyde St. at Green. Good news for the staff, however: they will be able to retain their team, including executive chef Robin Song, as they prepare to open their new project in the Financial District: ~THE VAULT~. It’s going to be a fine-dining project, and “the menu will emphasize exciting and elevated takes on classic Americana dishes.” Fine wines and spirits will be a highlight, and there will be private wine and liquor lockers for the building’s tenants (which include Goldman Sachs and Morgan Stanley employees—paging Gordon Gekko). 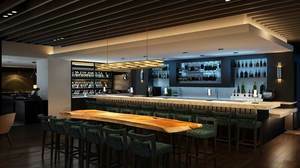 It’s opening at the base of the 555 California Street high-rise building, clocking in at 4,800 square feet (there will be a 60-seat restaurant with private and semi-private dining for 25, a 60-seat lounge, and 15-seat Carrara marble bar). D-Scheme Studio is behind the design. Look for a spring opening. Lunch and dinner will be served. 555 California St. at Kearny.